Recently, one of my cooking students asked me how many turkeys I have roasted over the years. My first Thanksgiving class was in 1988, averaging (some years were many more) ten classes per year, so the starting number is 220. Add the turkeys I’ve cooked for magazine and online articles, books, and my own holidays, and the count has to be at least 300. And I have never served a dry, tough bird. Would you like the recipe? When I worked for Perdue Farms, a leading poultry producer the East, I went to turkey farms and production plants, and learned waaaaayyyyyy too much about turkeys. The essential problem with a turkey is its build: The lean white meat is done before the tougher dark meat is cooked. My detailed recipe has a simple solution: Just cover the delicate breast with foil to deflect the heat and slow down the cooking in that area. And please follow my gravy instructions. They are foolproof—as long as you measure the ingredients and don’t eyeball them like my grandma did. She was a wonderful lady who made lumpy gravy. Make-Ahead: Roast the turkey just before serving. Never use an aluminum foil pan, as they deflect heat in the oven. A heavy roasting pan holds the heat and helps create dark, flavorful drippings that color and season the gravy. Do not baste the bird more than every hour or so. The drippings do not penetrate the skin and add moisture. Basting only helps glaze the skin. A little booze adds character to the gravy, but leave it out if you wish. Be sure to let the bird stand at room temperature for at least 30 minutes before slicing. This redistributes the juices throughout the meat. Carve too soon, and the juices spurt out and lead to dry turkey. Do make the Turkey Broth or its Small Batch cousin. It makes all of the difference in the gravy. Add some to the roasting pan during cooking to create steam that helps keep the bird moist. An 1-quart gravy separator is indispensable for gravy-making. 1. Position a rack in the lowest position of the oven and preheat to 325° F. Reserve the turkey neck and giblets to use in gravy or stock. Pull out the pads of yellow fat at both sides of the tail and reserve. Rinse the turkey inside and out with cold water. Pat the turkey skin dry. Turn the turkey on its breast. Loosely fill the neck cavity with stuffing. Using a thin wooden or metal skewer, pin the turkey’s neck skin to the back. Fold the turkey’s wings akimbo behind the back or tie to the body with kitchen string. Loosely fill the large body cavity with stuffing. Place any remaining stuffing in a lightly buttered casserole, cover and refrigerate to bake as a side dish. Place the drumsticks in the hock lock (whether plastic or metal, this hook-like implement is ovenproof, so don’t remove it) or tie together with kitchen string. 3. Roast the turkey, basting all over every hour with the pan juices of the pan (lift up the foil to reach the breast area), until a meat thermometer inserted in the meaty part of the thigh (but not touching a bone) reads 180° F degrees and the stuffing is at least 160° F, about 4 1/4 hours. (See Estimated Roasting Times, below.) Whenever the drippings evaporate, add broth or water to moisten them (about 1 1/2 cups at a time). Remove the foil during the last hour to allow the skin to brown, and give the skin an extra basting to color the skin. 5. Meanwhile, pour the drippings from the roasting pan into a 1-quart gravy separator measuring cup, or glass bowl. Let stand 5 minutes; then pour off the dark pan drippings, leaving the clear yellowish fat in the separator. (If using a glass cup or bowl, skim off and reserve the clear yellow fat that rises to the top.) Measure 3/4 cup fat, adding melted butter, if needed. Add enough turkey broth to the skimmed drippings to make 8 cups total. 6. Place the roasting pan over two stove burners on low heat and add the turkey fat. Whisk in the flour, scraping up the browned bits on the bottom of the pan, and cook until lightly browned, about 2 minutes. Whisk in the turkey broth and the cognac. Cook, whisking often, until the gravy has thickened and no trace of raw flour flavor remains, about 5 minutes. Strain the gravy into a bowl to remove any undissolved drippings. Transfer the gravy to a warmed gravy boat. Carve the turkey and serve the gravy alongside. Add an extra 30 minutes to the roasting time to allow for variations in roasting conditions. It’s better to have a bird done ahead of time than to keep everyone waiting and hungry for the bird to finish roasting. Make-Ahead: Turkey stock can be prepared up to 3 days ahead, cooled completely, covered and refrigerated. It can also be frozen in airtight containers for up to 3 months. Here is a full-flavored turkey broth to make whenever you have the time, and then freeze for use during the holidays. The giblets and neck of a single turkey make a weak (but acceptable) broth, so for the best stock, start with a generous amount of inexpensive turkey wings, which should be readily available at the supermarket at this time of year. If you don’t have a cleaver to chop them up, ask the butcher to the job. Don’t simmer the liver, which is too bitter. If your stuffing or gravy recipe calls for it, sauté the liver in a little butter. 1. Using a heavy cleaver, chop the wings and neck into 2-inch pieces. (If necessary, ask the butcher to do this for you.) Using a sharp knife, trim away any membranes from the giblets. 2. In a large pot, heat the oil over medium-high heat. In batches, add the turkey wings, neck, and giblets and cook, turning occasionally, until browned on all sides, about 8 to 10 minutes. Transfer the turkey to a plate. Add the onion, carrot, and celery to the pot and cook, stirring often, until softened, about 6 minutes. 3. Return the turkey to the pot. Add enough cold water to cover the turkey by 2 inches. Bring to a boil, skimming off the foam that rises to the surface. Add the parsley, thyme, peppercorns, and bay leaf. Reduce the heat to low. Cook at a bare simmer for at least 2 and up to 12 hours. As needed, add more water to the pot to keep the bones covered. 4. Strain the stock through a colander into a large bowl. Let stand for 5 minutes and skim off the clear yellow fat that rises to the surface. If desired, remove the giblets, cool, chopped finely and refrigerated for use in gravy. The neck meat may be removed in strips, chopped, and reserved as well. Cool the stock completely before refrigerating or freezing. 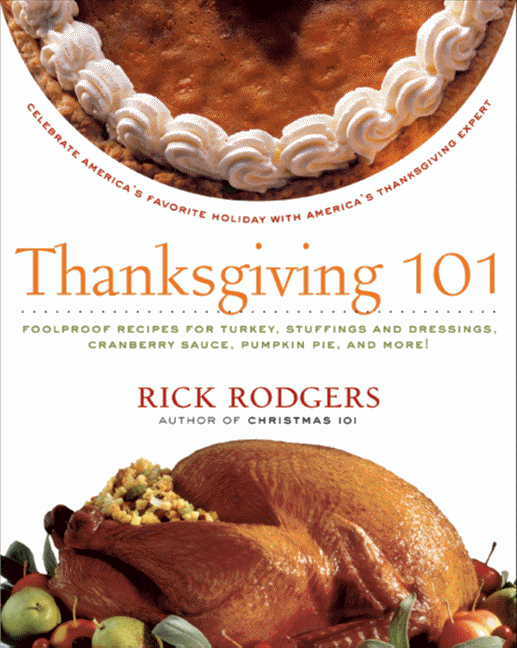 Tune in next month when Rick shares his favorite Christmas recipe! Small-Batch Turkey Stock: A smaller amount of stock can be prepared with just the turkey neck and giblets. As this relatively small amount of turkey won’t give a very full-flavored stock, use chicken broth (homemade or canned) as a booster. Following the instructions above, brown the neck and giblets from 1 turkey in 1 tablespoon oil. Add 1 small onion, 1 small carrot, and 1 small celery, all chopped, and cook until softened. Add 1 quart water, 2 13 3/4-ounce cans reduced-sodium chicken broth and bring to a simmer. Add 3 parsley sprigs, 1/4 teaspoon thyme, 6 peppercorns, and 1 small bay leaf. Simmer for 2 1/2 to 3 hours (the smaller amount of liquid would evaporate away if cooked longer).